State Department spokeswoman expresses concern over the IEC temporarily cutting off power in the PA because of its huge debt. 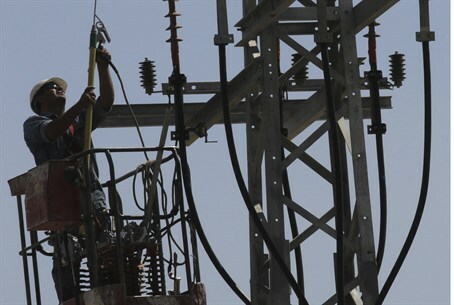 The United States on Monday expressed its dissatisfaction after the Israel Electric Corporation (IEC) briefly cut off power to Palestinian Authority areas, in protest over the PA's refusal to pay the nearly half a billion dollars it owes. “We’re concerned about the impact on the ground of any cuts to basic services, including electricity,” State Department spokeswoman Jen Psaki told reporters. “We remain very concerned about the continued viability of the Palestinian Authority if they do not receive funds soon, either in terms of the resumption of monthly Israeli transfers of Palestinian tax revenues or additional donor assistance,” she added, repeating statements she made last week. The IEC announced late last month that "due to a mounting debt worth nearly 1.8 billion shekels ($459 million), we have decided that...electrical supply will be cut," with the cut to include an hour each morning and another hour at night, until the PA starts to pay up. The PA acquires 95% of its electricity in Judea and Samaria and 75% of its electricity in Gaza from Israel. The Israeli supply to the PA-assigned areas continued over the years despite the huge debt and despite the fact that Hamas continues to carry out terror attacks aimed at Israeli forces and civilians alike. American officials over the past several days have expressed concern in recent days that the PA could cease to exist unless Israel resumes the transfer of tax money it suspended in retaliation for the PA’s moves to join the International Criminal Court (ICC). Secretary of State John Kerry on Saturday echoed the comments made by his spokeswoman and expressed concern about the viability of the PA.
"If the Palestinian Authority ceases, or were to cease security cooperation, or even decide to disband as a result of their economic predicament, and that could happen in the future if they don't receive additional revenues, then we would be faced by yet another crisis," Kerry said. "We are working hard to prevent that from happening and that is why we have been reaching out to key stakeholders to express these concerns and also to try to work together to find a solution to this challenge," he added. Some Israeli officials, including Energy and Water Minister Silvan Shalom, have suggested that Israel use the tax money it froze to pay off the PA’s enormous debt to the IEC. While blaming Israel for the PA’s financial woes, its chairman Mahmoud Abbas continues to spend six percent of the PA’s annual budget to pay $4.5 million a month to jailed terrorists and another $6.5 million to their families.